We are all human. And as humans, many of us like to partake in adult beverages – even if we are in the health and fitness industry. Some of us enjoy a scotch while others like to pop the top of a cold one and enjoy an ice-cold beer. Whichever you choose, you have probably noticed that there are no nutrition labels on them. Those interested in tracking their macros would often question how they should record their alcohol consumption (drinking in moderation). Bud Light has seemed to take the first step in transparency and is now adding their ingredients and nutrition label to their packaging. Is this a step in the right direction or has the brand had one too many in thinking this will change anything? Or maybe that’s just the point? Liquid calories are some of the most dangerous calories consumed simply because most people don’t think about how much they actually drink or even take the time to measure it out. This can cause considerable weight gain in both the short and long-term. When it comes to alcoholic beverages like beer, a weekend party or a night out with the guys can easily cause you to consume well over 1,000 calories without you even thinking twice about it. When you look at products found at the grocery store, you’ll notice a common theme – they all have nutrition labels on them showing the ingredients and macro-nutrients. This raises the question as to why alcohol isn’t required to follow suit? What makes the alcohol market different or special that they don’t need to be transparent with their products? A couple of years ago started a movement where those in the light beer category were fighting over who had the lowest calorie and lowest carb beer in the space. 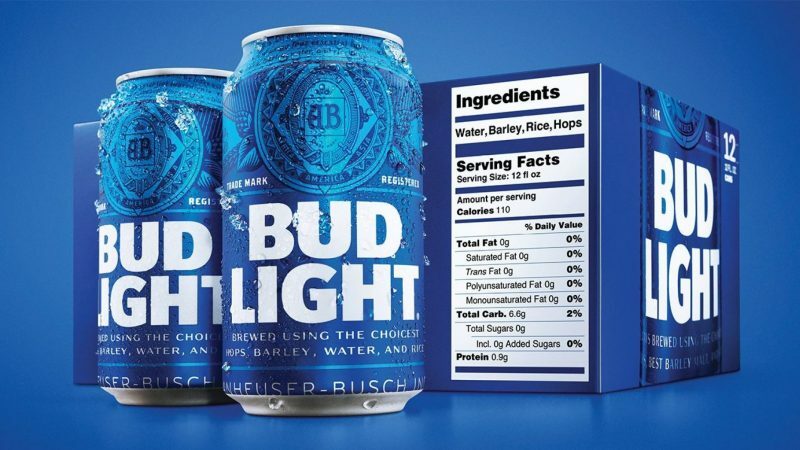 Now, Bud Light is making the first bold move by including a gigantic nutrition label on their packaging – similar to what you see required by the US Food and Drug Administration. Looking at the Bud Light nutrition label, at the very top, you will notice they list out all of the ingredients in the product. Underneath you’ll find the calories as well as the macro breakdown. This seems to be a step in the right direction but what will the overall impact be from adding the nutrition label to the packaging? While a step in the right direction, the nutrition label will only be found on the actual case of Bud Light. Individual cans and bottles will not have the nutrition label present where it breaks everything down. So, in the long run, will this really change anything when it comes to the overall consumption of the product? In my opinion, no. When you buy beer (assuming you’re 21), what do you generally get or do with your purchase? If you buy a beer from a bar, you either get the individual can or bottle (which won’t have the nutrition label on it) or you get it in a glass. In this instance, you still don’t know what you’re drinking unless you have memorized the nutrition label. The second scenario is that you purchased a case of Bud Light from a beer distributor or store and took it home. The packaging at that point would have the nutrition label present. But how many people put the entire case of beer in the refrigerator when they get home? Probably a very small percentage. What do they do? They remove the beer from the case and put the individual cans in the refrigerator which again do not show the nutrition label or information. Where does the packaging go? In the trash. Is this move just a “make you feel good” marketing ploy? Is Bud Light trying to make it seem like they are doing the right thing by being “transparent” with their light beer? Maybe… maybe not? But the interesting thing I’m finding here is that in most of the scenarios presented, the nutrition label means nothing as you won’t keep the case the beer came in and you aren’t going to find the nutrition facts or label while sitting at the bar so not much is going to change from my point of view. And showing the ingredients on the case does what? You’ll find water, barley, rice, and hops. All carbs and something (I’d hate to assume) most people should already know. After I started writing this piece, I found that research is on my side. Cornell University and Louisiana State University conducted a study that looked at the behaviors of those who went out to eat and were shown the nutritionals for beer when they were ordering. What they found was that showing people the breakdown of the beverage and food choices didn’t change their beer selection at all. In fact, the only thing it did was cause them to order lower-calorie food instead, but not because of the calories found in their beer choice. Rather, they were shocked by how many calories were in some of the appetizers they were considering as well as the entrees themselves. What this is showing is that when it comes to alcoholic beverages, people like what they like and seeing and understanding what’s in it has no effect on their buying and consuming behaviors when it comes to the beverage itself. Therefore, maybe adding the nutritional information is a “feel good” tactic with the understanding that consumer behaviors will more than likely not be affected one way or the other. 1. Click Here to Find Out!